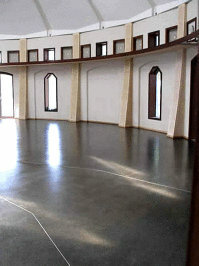 Central Hall Hobart, Tasmania - In the process of oiling the concrete floor. Central Hall Hobart Tasmania - Finished with Livos non toxic floor oil. 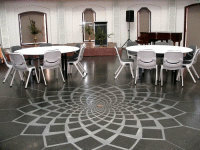 Central Hall Hobart, Tasmania - Concrete flooring finished with Kunos and Linus Oils. 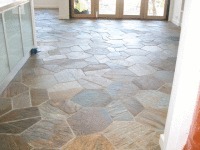 These eco prodcuts are hardy and well suited in high traffic areas. 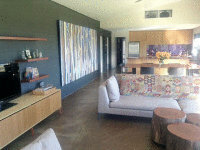 Central Hall Hobart Tasmania - A healthy and creative living space is created. 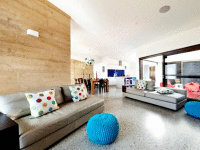 The Livos products not only aid in creating a healthy living space, they also lend themselves well to a creative flair. Note: Stage and window frames are treated with Kaldet Rosewood Stain. 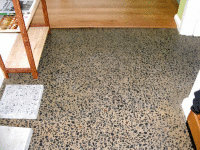 The slab is treated with Kunos and Linus. 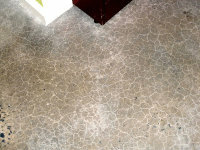 Concrete and Ply both treated with the Kunos oil. 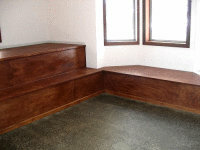 Here the bench is treated with Kunos Rosewood and concrete slab with the Kunos Clear, creating a perfect combination. 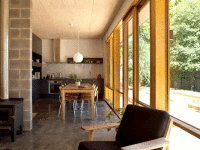 Award Winning Hemp Home - The Livos products aid in creating a healthy living environment and reducing a carbon footprint. The carbon footprint of this Hemp home is minimal with the Livos products aiding in creating a healthy living environment and reducing it's carbon footprint. 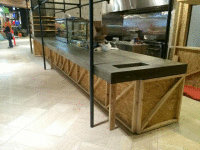 Concrete bench - treated with the certified food safe Kunos Countertop Oil. The slab was treated with Linus priming oil and 2 coats of Kunos with the ply doors and window frames treated with Kaldet Rosewood. 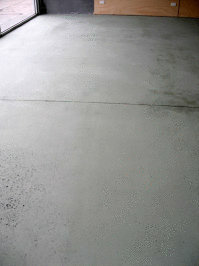 Tasmanian home - white oxide added to the concrete and treated with Kunos Natural Oil sealer White. White oxide was added to the concrete, ground to expose the aggragate then treated with the Kunos Natural Oil sealer in White. Opportunities are endless with the final outcome very dependant on the preparation of the surface. The final outcome is very dependant on the preparation of the surface. Livos Showroom - ground back to the aggregate. Livos Showroom Marketing Area - ground back to the aggregate and treated with linus and Kunos. Livos Showroom Office Area - cleaned and lightly ground back. 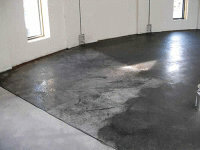 Livos Showroom Office Area - here the slab was cleaned (paint removed) and only lightly ground back. Treated with Linus and Kunos. 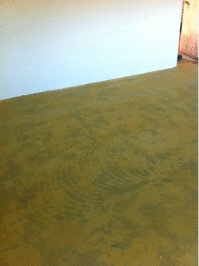 EucaFlora Nursery Concrete Floor - treated with Ochre colour Vindo and Kunos clear. 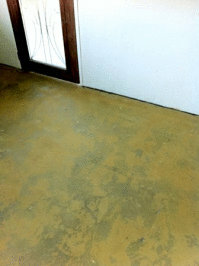 This old concrete floor was treated with Vindo in the Ochre Color then protected with Kunos clear. 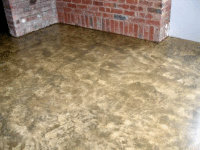 Concrete slab in a home - finished with Ardvos natural oil sealer. 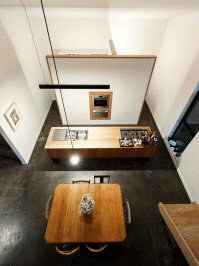 Impressive architectural design - Concrete slab finished with a dark tinted Livos non toxic floor finish. 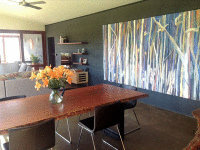 Girragira Retreat - Slab finished with Vindo Umber stain. 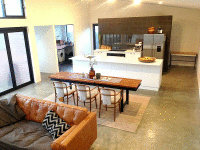 Girragira Retreat - A sleek finish and living environment has been created with the Vindo Umber stain. 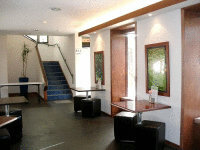 Concrete treated with Linus and Kunos, the ply ceiling with White Kunos and the interior/exterior with Alis Boxwood. Lifehouse Campbells Creek - Concrete treated with Linus and Kunos, the ply ceiling with White Kunos and the interior/exterior window frames with the Alis Boxwood.